For the second consecutive day, the Stanford men's golf team shot the low round of the day and jumped into fourth place at the NCAA championships in West Lafayette, Ind., on the par 72 Birck Boilermaker Golf Complex on Friday. The sixth-ranked Stanford men's golf team stands eighth after two rounds of the NCAA Golf Championships in West Lafayette, Ind. STANFORD, Calif. - The sixth-ranked Stanford men's golf team completed the first round of the 2008 NCAA Championships today at the Kampen Course of the Birck Boilermaker Golf Complex on the Purdue University campus. The Cardinal are in a four-way tie for 12th place with No. 19 Texas A&M, No. 42 Middle Tennesse, and second-ranked Alabama. The sixth-ranked Stanford men's golf team is gearing up for the 2008 NCAA Men's Golf Championships that will begin Wednesday,May 28 and run though Saturday, May 31 at Purdue University's par-72, 7,431-yard Kampen Course of the Birck Boilermaker Golf Complex in West Lafayette, Ind. The Cardinal are the current defending champions and will be looking to bring home their ninth NCAA Championship. It's easy to see, even at a glance, that the Stanford men's golf team hasn't had nearly as good a season as it did during its seven-win 2006-2007 season. Yet this week, the Cardinal finds itself exactly where it wants to be - playing for a second straight national title. J T KOHUT - STOCKTON, CALIF.
MATT HOFFENBERG(a) - SIMI VALLEY, CALIF.
JARIN TODD(a) - WOODINVILLE, WASH. ROB GRUBE(a) - STANFORD, CALIF.
JAMES HAHN - ALAMEDA, CALIF.
YUN-GI (KENNY) KIM(a) - CERRITOS, CALIF.
A - KEVIN CHAPPELL(a) - FRESNO, CALIF. The No. 11 Stanford men’s golf team will return to the NCAA Championships this year to defend its title after taking the sixth-place spot in the NCAA West Regional Tournament this weekend in Bremerton, Wash.
Four Stanford golfers advanced in US Open Qualifying, and three each led their respective local qualifiers for the US Open. The four qualifiers were Jordan Cox, Zack Miller, Joel Kribel and Brad Lanning. Current sophomore, Jordan Cox, fired a 66 to lead all qualifiers at CordeValle GC in Martin, CA. Zack Miller, All-American from last year's team, fired a 67 to tie for 1st amongst all qualifiers at Pasatiempo GC in Santa Cruz, CA. For more on Zack's play plus an update on his professional career on the Gateway Tour read this article in the Marin Independent Journal --- http://www.marinij.com/sports/ci_9247419. Joel Kribel, Stanford's only 4-time All-American also shot a 66 to lead all qualifiers playing at the Del Paso CC in Sacramento, CA. For a complete list of all US Open first stage qualifiers throughout the US go to the USGA website -- http://usga.usopen.com/qualifying/local-results.html. 1994 graduate Brad Lanning shot a 72 to qualify in Bradenton, Florida at the Ritz-Carlton Member's Course. Find more info about Lanning's qualifier at HeraldTribune.com. The NCAA has announced selections for the Division I championship and Stanford has received the 4th seed in the West region to be held in Bremerton, Washington May 15-17. For complete list of selections go to http://www.ncaa.com/golf-mens/article.aspx?id=227560. The official NCAA website for the West Regional will provide live scoring and also includes extensive information plus photos of the course. 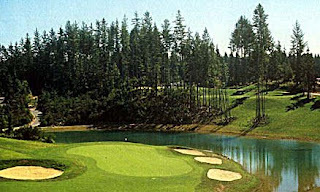 Here's the website for the Golf Mountain golf course, site of the West regional --- http://www.goldmt.com/sites/courses/layout9.asp?id=426&page=12203. Three Stanford golfers were honored by the Pac-10 for this season's play. Freshman Sihwan Kim and senior Rob Grube earned first team All-Pac-10 honors and freshman Steve Ziegler was named honorable mention. In addition Sihwan Kim was named the Pac-10 freshman of the year in a season when there were a number of top freshmen. For complete information click here.